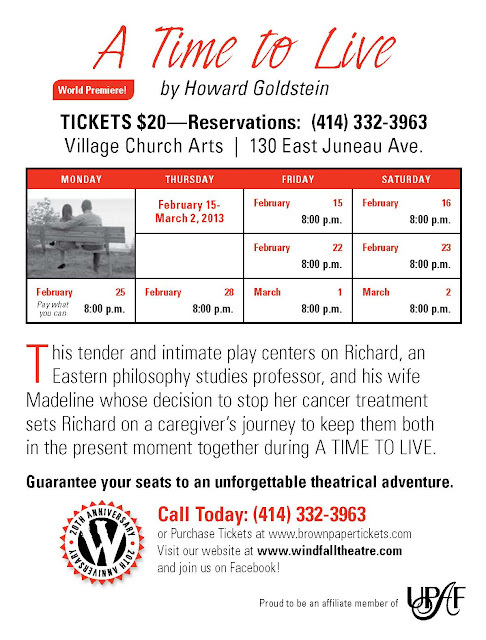 "A TIME TO LIVE" by Howard Goldstein*****This new play is superb! Highly, highly recommended. Opening night played to a full house. It is such a pleasure to be totally involved in a theatre performance with wonderful humour, the input of Buddhism and the rich symbology of the waters of the Great Lake of Michigan and the seasons. The two actors had incredible chemistry - an essential for this play. I've seen Romeo and Juliet where all was dead - ghastly. Do go and see this play written by talented local playwright - Howard Goldstein at the charming, intimate Windfall Theatre in the Village Church on 130 E. Juneau, downtown Milwaukee. This is a writer who knows how to use his words well - shear poetry. There's nothing that terrifies us more or gets talked about less than what it means to die - or the related prospect of soldiering on when those dearest to us are gone. That's the subject of Howard Goldstein's "A Time to Live," now receiving its world premiere courtesy of Windfall Theatre - an intrepid company that consistently stages plays involving those thorny subjects that matter most. “A Time to Live” is the kind of sweet-sad play that quietly breaks your heart. 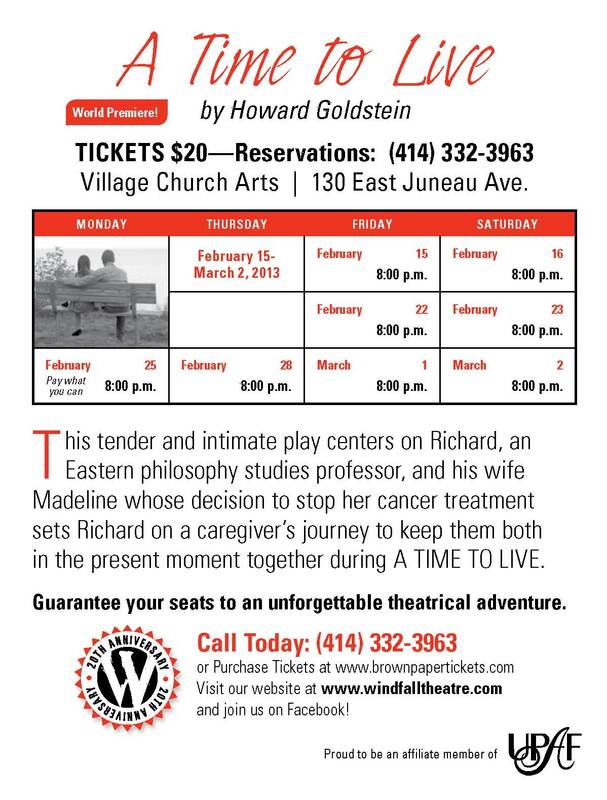 Written by local playwright Howard Goldstein and performed at The Windfall Theater in The Village Church on Juneau in Milwaukee, the story features a recently-married couple – she, a doctor, and he, a professor of Eastern philosophy, living through the last year of their life together. The setting is in Milwaukee, near Lake Michigan, a phenomenon of nature that figures prominently in the story. The structure is episodic as the journey of Madeline and Richard unfolds through the four seasons of the year. Besides the dialogue between the two characters, both speak directly to the audience at times, giving us some thoughts they don’t share with each other. The set design is simple but effective. It was a collaborative effort, shared by Carol Zippel (who also directed the play), Dan Austin and the playwright Howard Goldstein. Lighting was designed by Kevin Czarnota and is an important component in the story as time changes and wanes. The bed dominates the setting, but the window, the folding screen and the bookshelves filled with the “stuff” of their lives together also contribute to the story. Madeline is dying of cancer and has chosen to stop treatment and try to enjoy the time that remains. Richard doesn’t totally agree with her decision but tries to be supportive and accepting. A plethora of human emotions reveal themselves here – confusion, sadness, frustration, anger, love, fear, despair, hope. Because their personalities are quite different, of course each character deals with pain and uncertainty quite differently, but the constant in the story is their steadfast love; albeit how to express it is far from simple and straightforward. Madeline often seems to be pushing him away, helping him to learn to live without her, and Richard is either clinging or escaping. Ironically, his knowledge of Buddhist teaching doesn’t seem to be a very helpful guide for him. However, by the story’s end, one feels a peace and acceptance, indicating that both characters have reached some measure of wisdom in the painful process of facing their mortality. Beth Monhollen and Christopher Elst are superb in their roles. We grow to love them both but can’t quite understand how two such different people ended up together (but isn’t that always a mystery). The references to and descriptions of Lake Michigan, which becomes a symbol of forces beyond our control, a source of beauty and enjoyment, and a reminder of how life is forever changing, greatly enriches the poignant, poetic script. The intimate space of The Village Church is the perfect vehicle for a lovely but heart-wrenching piece such as this. 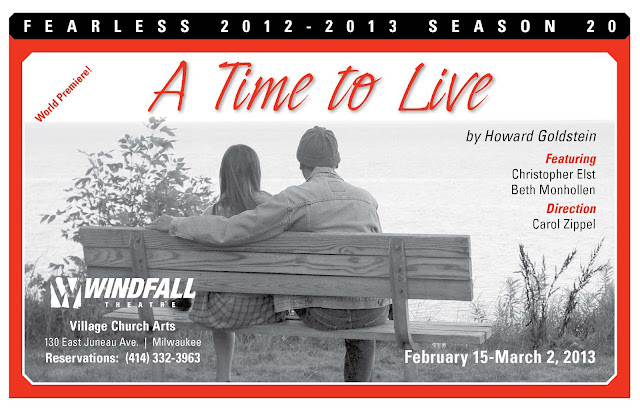 Remaining performances of “A Time to Live” are February 22, 23, 25, 28, and March 1 and 2. All shows start at 8:00 at 130 E. Juneau Avenue. Call 414-332-3963 or visit www.windfalltheatre.com for tickets. There was a full house on opening night, so don’t wait to reserve a seat. Milwaukee doesn’t see a ton of world-premiere shows in a given season, so A Time to Live, at Windfall Theatre, has high expectations built in...this not-quite-a-play – a portrait, perhaps – has a poetry all its own. Goldstein and director Carol Zippel have brought us something a traditional play – with a clearly defined rising action, narrative beats, through-line, climax, etc. – might not have been able to provide with such simplicity: an honest, unpretentious look at a couple forced to live through dying earlier than they ever could have imagined...as Time to Live develops, Monhollen and Elst gradually draw us in; every momentary success earns a smile of gladness and every reminder of her disease provokes a visceral tension...Portraits like this have existed in various mediums for decades, and will for decades more. But Windfall’s production of Goldstein’s play works because it stays on the right side of sentimentality and melodrama. Especially for a world premiere, that’s something to love. Founded in 1992, Windfall Theatre is a non-profit professional theater company with a three-show season.